If you haven't started your Jewelry Journal this post is here to get you started. What is it about? This is not a "these beads make me feel funny" journal, well actually it might be depending on how into beads you are. More to the point it is a journal in which you chronical your likes and dislike, report (a later reminder) technical difficulties and sketch out future designs. Go pick yourself out a cute blank book that is so sweet that it will call your name to come and fill it with content. Procrastinators may chose to buy a simple design and then spend the next 3 months decorating the cover, as you will. 1. Find 5 pictures of jewelry you admire and glue them in the book, do the same for 5 yucky pieces. Write a list of your likes and dislikes of each piece. What would you do better, different, or omit? If you are new to design this task will help you discover your own design style and taste. 2. Write a list of all the jewelry techniques you know. Put stars by the ones you are really good at. 3. Make a list of techniques you want to learn. 4. Draw a picture of a pair of earrings. Remember this is your journal so it doesn't have to be a fine art drawing, in fact lets just say "sketch" a pair of earrings. 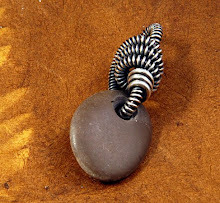 Try to include details like a bead cap or the wraps of a wire wrap. Use colored pencils to show off your style. 5. Make those earrings. If the design changes, write a note by the original drawing stating what changed and why. 7. Write a list of your material preferences. Do you like metal and which ones are your favorite and why? Do you love stones and which stones rock your boat? Are you a seed beader and why do you work with them? Try to relate some of your material preferences to aspects of your life. For example, I weave wire because it continues my childhood struggle of trying to make something beautiful out of cold hard reality. This task requires a proper atmosphere: light some candles, get a glass of wine, or put some heavy metal on the radio, whatever you need to get the words flowing. 8. Find amongst your jewels the designs that you consider to be original. Write a few of them up in your journal. What inspired you, why did you use what you used, what would you do differently next time? Do this task every time you make something. 9. Spend 1 hour cleaning up and sorting beads in search of inspiration. 10. Repeat the previous steps until you don't have to think about it any more and the journal begins a life of its own. Enjoy! I'd love to hear comments on this. Do you already have a journal? Do you have any tips that may help others get it going? Thank you for posting this Lisa. I've always wondered what the heck people put in artist/jewelry journals and how to get started on one. Now I have an idea on what to start, thank you! Nice post...I carry around a pretty substantial moleskine journal with blank pages and the nifty little accordian pocket in the back. In the front half of the journal, I sketch out ideas, which can come from anywhere really...a spiral on a signpost, pattern in someones clothes etc. In the back part I keep sketches with wire gauges and measurements for my core sterling jewellery items. Makes it easy to make multiples for my wholesale accounts etc. I tuck odd little things in the accordian folder, like a pebble from the beach or driftwood. Great post. I have a 3 ring binder with pictures of jewelry that I like. I wasn't keeping notes on what I was creating. I was relying on my memory, which turns out doesn't have a very long shelf life for certain things. So just recently I've begun keeping notes on the details of what I make. It sure makes it a lot easier to refer back to my notes. Although, I've become very disorganized lately. I have lots of little notes with sketches scattered everywhere. I think I have way too many ideas going on and I'm anxious to keep going. I really like your idea of the journal. I might just have to gather my scattered notes and get then in a journal. It's time to get organized! I also like your idea of taking jewelry you don't like and figuring out how to change it to what you do like.